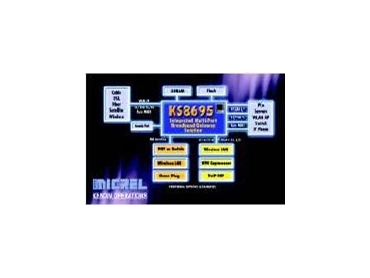 WITH the introduction of the KS8695, Micrel, represented by Braemac , has successfully integrated 5-port fast Ethernet transceivers, MACs, switch controller and on-chip frame buffer memory with a high performance ARM922T core, offering a fully-optimised solution for the SOHO gateway market. The KS8695 is a single-chip solution which integrates all the key components needed for a high-performance, low-cost, low-power multiple-Ethernet-port broadband gateway. The KS8695-based platform enables OEM/ODM customers to provide up to six times the routing performance of a typical existing gateway product. * A 166MHz 32-bit ARM922T CPU core with a memory-management-unit (MMU). * WAN port connection supports xDSL, cable modem, wireless and fibre.